On Saturday 28 December 2013, at 7:00 PM, AICafe invites you for Voices from Gaza Strip. 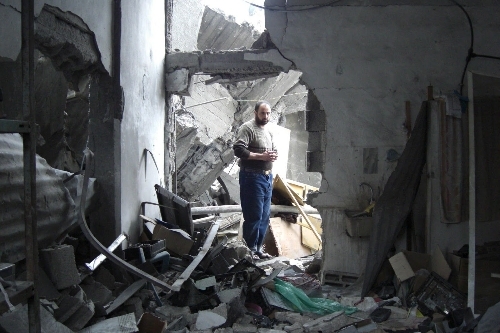 From 27 December 2008 – 19 January 2009, Israeli military forces pounded the Gaza Strip, killing some 1,400 Palestinians and causing massive devastation in the besieged enclave. While activists throughout the world were horrified at the levels of violence employed by Israel against the Palestinian civilian population, this violence was enabled by and signaled a change in attitude of most countries concerning Israeli policies. 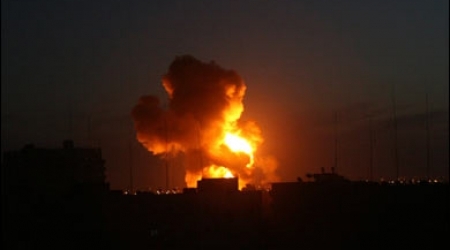 While the UN estimates that 75 percent of damage caused by Israel during these attacks have not yet been repaired four years later, the situation in Gaza has deteriorated further due to Israel's siege of the coastal enclave and political upheaval in Egypt. Come learn about political, social and humanitarian changes in the Gaza Strip since December 2008, with a focus on today's situation and what we can do as solidarity activists. AIC will screen Alberto Arce's film To Shoot an Elephant, an eye witness account from the Gaza Strip during Israel's 2008-2009 attack. Urgent, insomniac, dirty, shuddering images from the only foreigners who decided and managed to stay embedded inside Gaza Strip ambulances, together with Palestinian civilians. Following the screening, AIC will have a skype conversation with Ebaa Rezeq, a Palestinian activist from the Gaza Strip to discuss today's situation in the area. Join for this crucial evening! 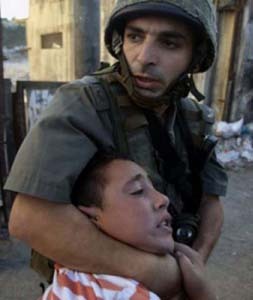 Israels Culture of Impunity: Nothing Less than Accountability! Euro-Mediterranean Human Rights Network (EMHRN) calls on the EU to reflect on its poor record to end impunity for serious human rights and International Humanitarian Law (IHL)violations by Israel against Palestinians living in the OPT. This Forum takes place at a time when the international community commemorates the first anniversary of Israel’s Military operation “Pillar of Defense” (November 2012), and the fifth anniversary of “Operation Cast Lead”,[PDF] (December 2008-January 2009) – which have killed 1,079 and injured thousands more . As of the end of 2013, Israel has failed to properly investigate the conduct of its forces in Gaza, including war crimes, and to hold those responsible for these crimes accountable. The culture of impunity goes well beyond Gaza and extends to Israeli military forces’ violent behavior against Palestinians living in the West bank; to Israeli civilians attacking Palestinians and their property and to Israel’s secret services torturing Palestinian prisoners as well. Several UN bodies have documented legislative, structural and operational flaws in the Israeli Military investigation system, as it has been confirmed by the UN Committee of Independent Expertson 18 March 2011. In February 2013, an Israeli appointed Commission outlined 18 recommendations to ensure Israeli investigations are in line with International law. Meanwhile, Palestinian victims continue to be denied access to Israeli courts and effective remedy because of Israel’s imposition of legal, administrative, monetary and physical barriers. Despite its commitments to promote respect for IHL and the Rule of Law, the EU has failed to effectively address these concerns, both in its bilateral relations with Israel and in the context of the UN. The EMHRN deplores that the EU has instead strengthened its relations with Israel and supported the country’s representations in foreign forums around the world –thereby forsaking to condition them on Israel’s respect for international law. The EU-NGO Forum on Human Rights is an annual conference where EU institutions and Member States interact with civil society and discuss how to promote and protect human rights. Under this year’s overarching theme of the “Fight against Impunity”, the EU is expected to come up with strategies to break the cycle of impunity for gross human rights violations with a specific focus on access to justice and reparation to victims. Condition its relations with Israel on respect for IHL and IHRL. Only 3 indictments have been filed against Israeli soldiers in relation to Operation Cast Lead.Two soldiers were convicted to a 2 month imprisonment sentence for using a nine-year-old boy as a human shield. The third soldier, who was prosecuted for stealing a credit card, was paradoxically convicted to a sterner seven-and-a-half months of prison. Of the 25 complaints submitted by The Al Mezan Center for Human Rights to the Military Advocate General 6 criminal investigations were opened none of which lead to indictment or compensation. This despite the gravity of the offences (including the use of civilians as human shields) and the fact that the testimonies of Israeli soldiers matched those provided by the victims. In relation to Pillar of Defense, no indictments have been filed, No indictments have been handed down as a result of the 246 civil complaints submitted to the Israeli Ministry of Defense and the 79 complaints to the Israeli Military Advocate General by the Palestinian Center for Human Rights (PCHR). Of the 17 complaints submitted to the Military Advocate General by the Al Mezan Center for Human Rights, 3 were dismissed on the basis that the soldiers acted within the rules of the law of war and 3 investigations were opened without further updates provided over the past 6 months. The remaining 11 cases received no responseraising serious questions regarding promptness. On 16 July 2012, the Israeli Knesset approved Amendment No. 8 to the Israeli Civil Wrongs Law (Liability of the State),which exempts the State of Israel of any liability arising from the damages caused to a resident of an enemy territory during a ‘combat action’ or ‘military operation’. As this Amendment applies to the Gaza Strip retroactively from 2005 onwards, Israel has effectively exempted itself of any liability for the victims of Operation Cast Lead and Pillar of Defense. According to the Public Committee Against Torture in Israel of the over 750 complaints of torture filed against Israel’s Security Agency (ISA) interrogators over the last decade, none have been criminally investigated by the Attorney General,. According to the Israeli NGO Yesh Din, 3.638 complaints have been filed for criminal investigations of Israeli Defence Forces personnel between 2000 and 2012. These have resulted in only 117 indictments (3.2%). According to figures compiled by Yesh Din,91% of investigations into crimes committed by Israeli settlers are closed without indictment. 84% of those closed without indictment are closed due to investigation failures.